If you're curious about what it takes to develop a new spaceship to take astronauts beyond low-Earth orbit — to destinations such as an asteroid or Mars — you'll have a chance to find out this week. 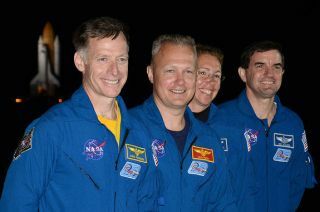 NASA astronaut Rex Walheim will be conducting satellite interviews from the Johnson Space Center in Houston on Thursday (June 28) from 7 a.m. to 8:30 a.m. EDT (1100 to 1230 GMT) live on NASA Television. The veteran astronaut will be standing in front of a full-scale model of the Orion spacecraft, and will discuss the new spaceship's design and testing process. SPACE.com staff writer Denise Chow will be speaking to Walheim Thursday morning, and will try to ask as many reader questions as time allows. If you have a question about the Orion spacecraft or NASA's exploration goals, please submit them in the comment section of this article. The Orion spacecraft will undergo an unmanned test flight in 2014, launching from the Cape Canaveral Air Force Station in Florida. The capsule for that first space-bound journey is scheduled to arrive at NASA's Kennedy Space Center in Florida next week, agency officials said in a statement. Once it arrives in Florida, the spacecraft's heat shield will be installed and the capsule will go through a series of checks. The 2014 test flight, called Exploration Flight Test-1 (EFT-1) will be the first for the Orion program, and will send NASA's next-generation crew vehicle farther into space than any human spacecraft since the Apollo 17 mission to the moon. Walheim, 49, flew three space shuttle missions, including the program's final flight, STS-135, in July 2011. He will provide input from an astronaut's perspective about the development and testing of the Orion spacecraft. Walheim, who was selected to become an astronaut in 1996, is the Astronaut Office's main liaison with the Orion Program.